Whether you’re ready for it or not, anxiety can strike at the worst of times. Of course, no one can truly prepare for anxiety because it’s something that just…well, it just happens and there’s really no other explanation for it. This seemingly unexplainable feeling of being uneasy and uncomfortable can be triggered by many different things. Naturally, what triggers anxiety in people is highly subjective — what makes one person anxious may make someone else feel completely at ease, and vice versa. While it’s true that something like the presence of a spider, a looming dentist appointment, or driving in rush hour traffic might instill more anxiety in someone as opposed to going to a social dance event, it’s beyond worth acknowledging that many people fear the idea of dancing around others. Like many other fears and anxiety triggers, this is completely normal, and something we work hard to help our students address and overcome. Dance Confidently With Our Social Ballroom Dance Lessons! Modern Ballroom Dance Studio addresses dance-induced social anxiety through our social dance lessons in Woodbridge, VA. When you attend one of our social dance classes, you’ll find yourself in a fun, no-pressure environment that’s designed to make you feel more comfortable in your own (dancing) shoes. You don’t need any previous experience to take a casual social ballroom dance course, nor do you need to be flexible or even remotely coordinated. Simply show up with an open heart and an open mind and we’ll help you get your feet moving! 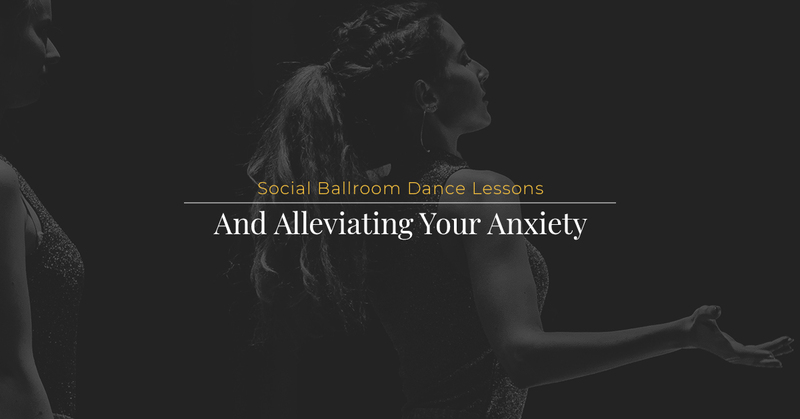 Though situational anxiety and chronic anxiety are complex conditions to address, our dance studio in Woodbridge offers several effective ways to target and overcome your social dance anxiety. Keep reading below to become a master of the dancefloor at your next big event! Again, we know that something as complicated and personal as anxiety can’t be remedied with something as simple as a few deep breaths. However, a few intentional deep breaths never hurt, and if anything, they’re always going to help calm you down in some capacity. Deep breaths should help you clear your head, and filling your lungs with extra air before you enter the dancefloor is never a bad idea. Drinking should never be a cure-all solution for dance-induced social anxiety or any of life’s problems. However, there’s also nothing wrong with taking advantage of an open bar at an event in which you’ll be dancing. Remember to limit/space out your alcohol consumption, and to only drink on a somewhat-full stomach after hydrating (and continue to hydrate as you drink/dance, you’ll need to if you’re sweating up a storm!). There’s a sweet spot when it comes to alcohol and lessening your social anxiety and self-conscience in relation to your dance moves, but again, don’t overdo it because your movements will get sloppy and you may end up hurting yourself or others around you. Do you know who’s not going to truly judge you? Your friends and family. And though you may not have the luxury of bringing these people to an upcoming dance event, at least stick with your date or dance partner. Whether or not they’re good at dancing, remember, they’re sticking this one out with you! It’s so easy to feel like everyone in the room is watching you and judging you solely based on your dance moves. In reality, most people are too distracted by other people dancing, the music, lighting, or other conversations to notice how you’re moving around. Heck, other people may be just as concerned as you are about their own dancing! It just goes to show that self-conscience is, as the term would imply, self-induced. Stop By Today For Our Social Ballroom Dance Lessons In Woodbridge, VA! The best way to attain confidence and swagger on the dancefloor is to learn from one of our knowledgeable, passionate, and incredibly friendly instructors. Learn more about our new student special or contact Modern Ballroom Dance Studio today to get started!